Charges have been filed against a suspect arrested in the fatal stabbing of a man at 6150 West Tidwell about 3:15 p.m. on Tuesday (Jan. 4). 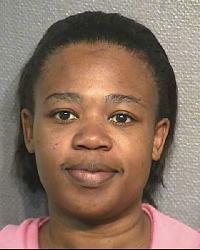 Tomekya Scheree Timmons (b/f, DOB: 7-14-80) is charged with murder in the 351st State District Court. The victim, Alton Lamarr Straughter, 49, of Houston, suffered a stab wound to the chest and was transported to Memorial Hermann Northwest Hospital where he was pronounced dead. Timmons followed Mr. Straughter to the Aspen Apartments at the above address. Witnesses reported hearing her yelling at Straughter, accusing him of stealing her purse. She followed him around the premises, and near the back of the apartment complex, produced a weapon and repeatedly stabbed him. Straughter then staggered to the front of the complex where he collapsed. Timmons then stood over him and continued yelling at him about her purse. She told witnesses that Straughter had stolen her purse and then walked away from the scene when she heard police were en route. On Thursday (Jan. 6), Timmons was arrested without incident.